It starts at the counter with the right hardware. If a computer system can generate twice its cost in direct operational savings, why would you care how much it costs? In fact, you'd probably want the best, most reliable hardware you can find, right? At DCCS, we don't settle for hardware that just works, we provide dependable leading brands that stand up to the rigors and everyday demands of a dry cleaning plant. Carefully selected components with years of proven reliability and performance translate to savings that go right to your bottom line. Are You Still Looking Up, then Down? If your answer is yes, you're probably still using a keyboard. 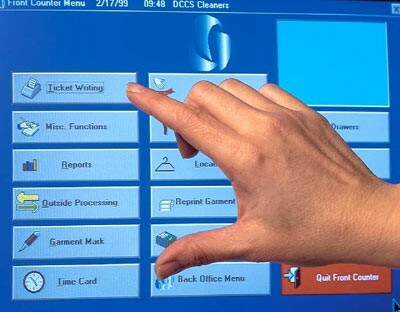 The simplicity of Dry Cleaning Computer Systems already allows for the least knowledgeable employee to be productive in minutes. Add a touch screen, and watch your CSRs service the customer with the greatest of speed and proficiency. Apply that same DCCS touch screen speed to production 60 minutes later you've marked in and tagged up to 100 pieces. Cost effective?....extremely! DCCS's front counter software is the only product in the industry designed for 100% touch screen.